I’ve done similar reflections before for the purpose of synopsizing the day, reevaluating present exhaustion, mitigating negative thoughts, or simple journaling. Intuitively and experientially I know that this type of reflection is undeniably positive and that it takes a negligible amount of time. So why don’t I use this beneficial exercise consistently? 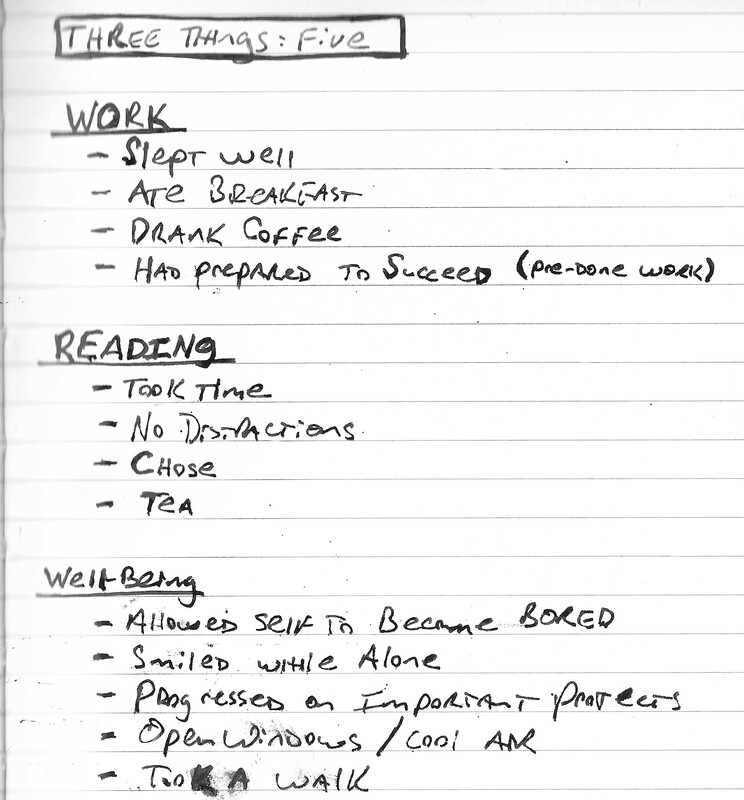 A minor commitment to myself: set aside 10 minutes to reflect on three things every day starting today. via A Simple Exercise to Increase Well-Being and Lower Depression from Martin Seligman, Founding Father of Positive Psychology | Brain Pickings. It would probably be beneficial to copy the idea motivated by the image linked below. The individual has selected and photographed meaningful combinations of his clothing. While I’m not particularly vain, it is clear that engaging with my wardrobe would help me to rid myself of what is numerically a nightmare of items. I have a bizarre assortment of pre-college/marriage/grad school/etc. clothing. I’ve encountered many pieces of advice about wardrobe reduction over the years and the perspective was always negative. This series of photographs focuses on the positive aspect of intentionally selecting combinations of clothing. It seems to me that it would be easy to replace damaged or over-worn items with relative ease when necessary because it would be clear what part of your wardrobe had been lost. I also imagine that this would keep my closet from becoming too unruly because I would truly know what was in there. Friends, Romans, countrymen, lend me your ears: I’ve finally built up the resolve and made a decision that has been a very long time coming: I’m done. I’ve long considered Facebook to be not much more useful than a self-updating Rolodex (and it is only good at that due to the hard work of all of us), but I’m perturbed enough by news this time around that I’m done. An article at Forbes , of scary interpretations , of additional violations I didn’t ask for , or for the next round of privacy setting tweaks via a handy guide from the EFF to make Facebook temporarily palatable again . I’m done. If you choose to stay, I won’t feel bad. I might be a little sad though. I chose to stay for a long time. Maybe you’ll be ready the next time something adversely changes (and it will). I would ask that you ask yourself a question right now: where is the line? Write it down, put a date on it, and use it to remind yourself of where you felt the line was today. Your future self would then have a choice to make. If you move the line, then keep a record of how often you do that (I know I moved the line a lot in the past years). Write goodbye message to everyone (and be a good friend and assist them in leaving with you). Disable auto-login to Facebook (check w/ your browser, phone, tablet, etc). After hitting “delete,” add the following lines to your /etc/hosts file. Thanks for listening and considering. Two years ago I threw some money at an idea. The idea was big: raise $11,000 to hire an orchestra to record some music. The music was in the public domain — Mozart, Beethoven, etc. — but recordings of it were not. So, if you were able to read the public domain sheet music and produce the sounds from instruments with your own hands then you were free to hear the public domain music. If you weren’t, well, you weren’t able to hear those sounds unencumbered by copyright. You couldn’t use those sounds for your art, your life, or your business without the possibility of legal action being taken against you. If you’ve read this blog in the past you’re aware of my thoughts on copyright and how those thoughts emerged from my use of GNU/Linux and other free–as in freedom–software. You see, there’s this thing called DRM that makes it hard for people to do things with their files (like listen to a song on another player, or read an e-book on another device). These things should be easy, it is the 21st century after all. But it isn’t. The Author’s Guild has fought to prevent e-readers from digitally speaking aloud the text (for blind readers) in the name of copyright, claiming that the out-loud reading is a derivative work. DRM has a hand in all of this. The 21st century has yet to live up to its promise (and its reality) in part due to copyright laws. The idea that there was a way to support the public domain, spread art, and inspire the public was too good to pass up. I donated what little I had and waited. It turns out others, at least 1200+, supported this idea too. It obliterated its $11,000 funding goal and raised nearly $70,000. Now, two years later, that music has finally been released. If you’re not already aware of my #2510s project I’ll give you a brief recap: I wrote 25 ten-minute plays over the summer of 2011 and released them on the web. Each of 20 of the 25 plays were rewritten using some exercises I’d been developing and testing over the past couple of years. Some were successful for me, some weren’t, but I’ll leave the final evaluation up to the reader. At any rate, I’ve finally finished putting all of those exercises into a digestible form. If you’d like to see them, click here. 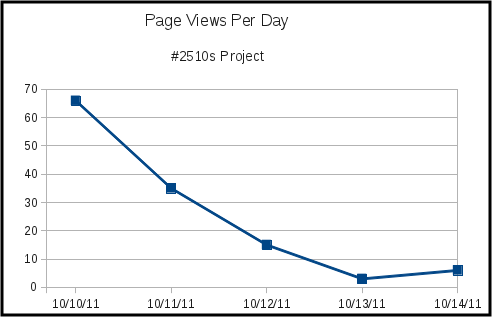 The exercises are arranged in the order I used them for the #2510s project (day by day, week by week). There are 20 exercises based on four broad areas: visual art, music, acting/directing, and dance. I hope you’ll find it worth your time to take a peek. Feel free to try them out on your own work as well. They’re fairly rigid in their current form (they dictate a certain number of steps from which you are not supposed to deviate) but feel free to experiment with them. The “translation” from other mediums to playwriting isn’t a 1 to 1 type of situation (as you’ll discover if you take a look). Also, I’ve tried to give these exercises as broad an audience as possible, so often the “translation” is often reductive or somewhat abstract. If you have a particular knowledge in one of these areas you an certainly use it to your advantage and increase the complexity &/or specificity of the exercise. But if you don’t have special knowledge in an area have no fear: I’ve tried to make each approachable and employable with little expert knowledge. At any rate, head on over. Let me know what you think. Enjoy. So I started a little project. I use the term “little” because that is how it appears to most outside observers. To me it is far larger than a “little” project. I can count the days and hours spent on the creation of the final product itself. None of that, however, involves the time spent leading up to creating the work. The yellow brick road began long before I started piecing together any of the disparate ideas that would ultimately allow such a project to form in my mind. At any rate, I started a “little” project. Tuesday: Modify “Monday Script” with Playwriting Exercise. Wednesday: Modify “Monday Script” with Playwriting Exercise. Thursday: Modify “Monday Script” with Playwriting Exercise. Friday: Modify “Monday Script” with Playwriting Exercise. This became the flow of my life for five weeks. Each week, then, is a curious set of material that is ultimately very strongly related with itself. So, in essence, there are five groupings of related plays. Now, I know what you’re thinking: “You wrote the same play five times? psssh! BORING!” My answer might surprise you: You’re not entirely wrong. This could be very boring indeed (and, for some of the modifications, it’s a defensible position to take). However, before you jump to that conclusion entirely, I’d like to point you to three of the “Week One” scripts (that, as of this writing, are already posted on the website). I’m providing links below for each of the PDF files. Even a cursory glance at each of the plays will reveal how striking the differences were within the first week of scripts. The variations and modifications do not, in fact, have to be boring or remarkably similar. In fact, 1.0 and 1.1 are probably the most similar of any of the scripts in “Week One,” and it is this wide variety of material that was particularly interesting to me. How much can a script change? How much might it possibly improve? How quickly can these changes occur? 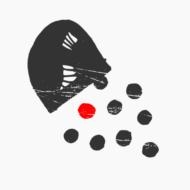 A very (very very) modest amount of interest was generated on Day #1 of the project — New! Shiny! — but as you can see from the graph above, that tapered off very very quickly. (And, of course, not every person who visited the site downloaded one of the scripts… and not everyone who downloaded a script actually read it… and on and on.) Does this make me cry? No. Is it disappointing? Sure. I wish more people would see the work for a number of reasons. That’s not entirely up to me though. I’ve worked on this stuff and put it out there. I have to rely on others to extend its reach for me. Perhaps that other is you. One of the reasons I release my works under a free culture license is because I truly believe that it is congruent with the present. Despite governmental movements indicating otherwise, lobbying money swaying against it, and decaying business models crying out that they are, in fact, acting on behalf of “the artists” and their “best interests,” I believe we’re swinging in the other direction. I believe we are firmly moving towards something more open, more accessible, more shared, and with more rights for the end user. Maybe it will take a while, but can’t you feel the momentum? At any rate, the below graph (via the thought-provoking questioncopyright.org) indicates my ultimate hope for these works (in terms of their use and exposure). I’m not saying that “they’re good” (that’s up to you), and I’m certainly not expecting them to become “classics” (they probably aren’t), but for right now they might just be worth reading, seeing, using, remixing, or otherwise benefiting from in some way. Again, though, that’s up to you. At any rate, I’m just waiting for the up-swing. If you enjoy a play: share it and/or do something with it. I couldn’t really ask for anything more wonderful — more current — than that. Pop marketing guru extraordinaire Seth Godin had a marvelous post recently. It was titled Time for a workflow audit, but the relatively short tidbit inside sparked a moment of self-reflection on my part. By the way, if you’re not following Seth’s daily tidbits of advice you should be (and you should use RSS). If you’re asking yourself “What is RSS?” or you’ve just returned from Google to find that I’ve caught you not knowing don’t feel bad. You’re not alone. This is perfectly normal. No one can know everything. If you’re a little older than me and thinking that the younger generation has this innate knowledge and understanding of existing technologies you can rest easy: they don’t. I’ve been around plenty of my peers (and those more than a decade younger) who waste time day in and day out because they’re not aware of existing tools, functions, or programs that could do those repetitive tasks for them. They unknowingly do it the hard way. I say again: you are not alone. While my degrees are almost exclusively in the Arts (specifically theatre), I’ve long had a side hobby of technology. I’ve blogged about this hobby before (most notably in my post Why I Choose Creative Commons BY-SA). This technology hobby initially grew out of interest in automating repetitive tasks along with a fascination with the complex randomization that computers could perform. Perhaps more generally, it has always been about ensuring that the tools I use are fast, effective and productive. The other (more negative) way to put it is that I spend gobs of time trying out every tool under the sun in order to find the best one for any given task. I wrote one example recently concerning my minimalist writing environment. Productivity can be an end in and of itself though. You can be so focused on being “productive” that you forget to actually do anything. Merlin Mann sarcastically attacks the minimalist trend in a very funny (and, for those of us who have been trapped by such snake oil in the past, heartbreaking) video. The point being that an entire market has emerged to sell the product of being productive in the digital age. This varied industry probably decreases productivity overall, despite occasional moments of insight. How could such an industry emerge? It’s easy: we deal with incalculable and inescapable information every day. More troubling, it’s always with us on our computers, phones, and other devices. It is, clearly, a problem. Technology causes this problem and, paradoxically, technology can be utilized to solve it. The interesting thing about Seth’s post was that it was from a different perspective than my own. His perspective revered and found value in skills and knowledge I happen to possess. I don’t often value my own skills or knowledge. Seth’s post, however, reminded me of how often I end up getting asked about how to do some task (which is to me rather mundane) and being heralded genuinely as the savior of the moment (or day, or year, et cetera). The person I help is extremely grateful to have received help, they’ve learned something (if they were paying attention and interested in learning), and I’ve done my part to make the world a better place. Further, it occurs to me that I’ve been “hired” before to do similar things: introduce a professor to blogging (particularly the site setup), guest lecture for a graduate arts administration class about how to effectively use Microsoft’s Excel for whatever task they could imagine, recommend digital time-saving techniques for my own students doing work for other courses, and a host of other examples. As a teacher, I have a profound belief that everyone can learn. This belief leads me to diminish my own particular skills (whether innate or acquired) in favor of assuming that everyone generally has (or can have) the same skill sets and interests I do. Seth’s post reminded me that other people (maybe even you) find skills I possess valuable. These are the skills I happened upon, not through formal training, but through a genuine interest and desire. They are skills I live every day. These are the skills that make my peers stare over my shoulder in confusion as I quickly go about my daily work on a computer at lightening speed. These are also the skills that make watching most other computer users go about their work a frustrating experience for me (especially if I’m waiting on them for something). These are skills that are worth something. So, I second Mr. Godin’s call to find a geek, sit them next to you, and ask them how you can work better. I, however, second it from the other side. As such, I’m open for business. Last semester I penned a play called The Decision and asked for comments from a variety of sources (including in the comments of this website). The comments did not flood in. One of the difficulties of crowdsourcing something like dramaturgy with lengthy material (even as short as my ten-minute play) is that a play is too long. The concept of crowdsourcing almost requires something that can be consumed in one quick gulp. At any rate, the comments did not come. While many people downloaded the play I don’t imagine that all of them read it. I also don’t imagine that all those who did read it had a particularly strong reaction to it (at least not strong enough to tell me what they thought). As luck would have it, however, my show is being produced. That means people have to translate those words from that “distraction-free” environment into the bodies of living actors, the reality of a physical space, and (eventually) into something an audience would pay to see (read: not my computer screen). These people must have an opinion. Directors, and Dramaturgs, and Designers! Oh, my! These wonderful people are tasked with something incredibly difficult. They are tasked with translating my 2-D writing into a 3-D production. If the writer is alive (Me = Alive / Shakespeare = Dead) and they are available (or it is the first production of the play) they are typically consulted as more of a collaborator during the production phase than our dear friend Shakespeare is these days. One result of this collaboration happened recently when some of the production team graciously met to discuss my play. They came up with a series of statements and questions about my play that they shared with me. This is extremely helpful. Part of why I am interested in crowdsourcing the dramaturgical function for my plays is that I like ideas. I’m not the smartest person in the room, even if I am fairly intelligent, because we’re all smarter together. Together we come to better decisions and ideas than we do apart. The list of questions they asked of me (and statements they made about the work) really help me see the play from a different perspective. I’m able to figure out what is working and what is not working. Oftentimes my wonderful production team helped identify why something wasn’t working (or was confusing). This is even more helpful. 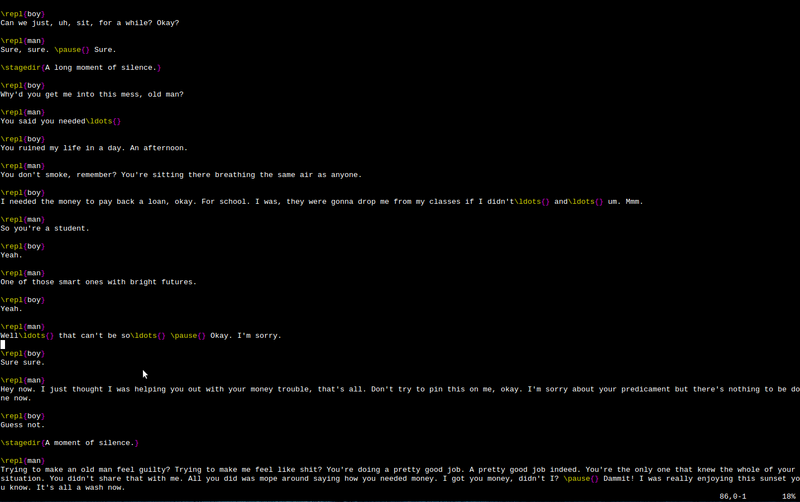 The process also forced me to describe what I’m doing in non-playscript format. You can no longer hide behind the metaphoric language of a play or the suggestive stage directions — you have to explain yourself concretely. It turns out that this is an important step as it solidifies your goals and refocuses your selective eye. To that end, I wrote another draft. Of course it’s more than just words that change. Since plays are composed of “just words,” yet are able to elicit emotional responses, physical environments, and human actions, more than words change in even the smallest changes for a new draft. I’m not going to get into the various changes here. I will, however, note two things that stand out to me in this draft. The idea of stopping the world with your finger. Once in reference to a small globe to find a new place to live (or possibly run away to). Finally in relation to the passage of time — the spinning of the actual earth. Mathematical skill, terms, and metaphors. If you’re interested in locating the differences between Draft #1 and Draft #2 those concepts are the main ones that I’m aware of (because writers do not know everything about what they write). These are both under the unfortunate All Rights Reserved until after the production. Then they will be released cc by-sa. Enjoy — and I’d love to hear what you think in the comments. As for using the work as a monologue: Yes you can. I’ve already given the okay in the license. (But thanks for asking/letting me know). I use the cc-by-sa license which essentially says “please attribute my work to me, perform/remix/adapt it, and if you create something new with my art please do unto others as I have done unto you.” You can read the actual license here, but this confusion is a preventative force for the dissemination of my work on what is otherwise a great system (the internet) for exchange of content and ideas. Let me be clear: I want you to use my work. Please use my work as an audition piece if you like it. Please include my work in your collection of short plays if you think it fits. Please print off 20 copies for your high school English class and analyse the language (and send me thoughts for what I might think about improving). Please e-mail my work to that person it reminded you of. Please create a scenic design for that play of mine you like (or lighting, or sound, or use it for a class, etc…). Please produce my work and take pictures and upload them somewhere (even a video). I used to be confused about this license. I used to be cynical (Conan may help you see the light). I used to think that these licenses were merely traps. I used to think that these people offering something for “free” just wanted me to contact them with a link to how I used it in order to sue me (or some other nonsense). This isn’t a trap. I didn’t write these plays for them to sit in a drawer unused and unread forever: I wrote them to share them. You don’t have to let me know if you’ve done, are doing, or will do my work. I would love to hear about it though. Send me an e-mail, post in the comments on the play’s page, or do something else that is wonderful. I’m honored that you’d think of using my work. Please do. “Why are you not using copyright” or “why would you let people copy your stuff?” Well, I am using copyright (despite my opinion of it) because Creative Commons is a copyright license and it is my right to distribute and share my work in any way I choose. In other words: it is my right to give you rights. For those of you who want the short version feel free to simply watch the graphic below. I didn’t create it (in the way we typically think about creation). I manipulated a static slide from a presentation distributed on the internet and added items at the beginning and end. I “adapted” or “expanded” or “stole” or “borrowed” or add your own term from the idea(s) in the presentation and the graphic in the presentation to make something new with that preexisting material. For those interested in the longer explanation of how I came to decide that this type of license is important you can read the whole post. I’ve been doing art for a while now but it was, strangely, software that got me here. In fact, if you know me and wonder why I do the things I do concerning software, this post will partially serve to address that as well. What started out as a need to find and use some no cost software (Firefox and OpenOffice) steadily turned into GNU/Linux toe tipping, then a full-fledged GNU/Linux operating system install, growing interest, then hobby, and finally turned to several subtle forms of activism. I grew tired of not being able to open documents my students composed on older versions of software. I grew even more tired of not being able to open files from students who didn’t drop the cash to have the “official” word processor and instead used the one that came “free” with their operating system. My new interest in software slowly became activism because of the problems I saw my students facing with proprietary software. Indeed there were (and are) issues relating to software. One of the most startling legal leaps from computers to art was the RIAA’s lawsuit-parade against music sharing (or as they would have it: Piracy and Theft). Computers + Internet + Innovation + Artistic Content led (some say inevitably) to Lawsuits + Copyright + Courts. One of the outgrowths of the internet was Napster which was a new way to copy music and share it with others over the internet quickly and easily. Damaging responses from the content owners (read: not the artists) quickly followed. One of the most damaging responses was for the music industry to sue their own customers. Another damaging response was DRM. DRM can be applied to digital content you purchase (though the industry would like to redefine “purchase” as “license”) meant to prevent you (the computer user) from using your computer in the way you desire. Proprietary formats demonstrated the problem with DRM (at its core) when I found myself recreating my entire digital library from the disks I owned because of the proprietary format I had originally used to encode the tracks. I can’t tell you how happy I was to have never purchased DRM’ed content at that moment. You see I care about music. I buy it, I love it, I listen to it, and I am willing to part with lots of hard disk space to listen to it on-the-go at full quality. The problem came when I was moving from a Mac back to Windows. At the time Windows couldn’t read the proprietary music file format used by Apple… so I had to start over. This time I sought out and intentionally used the FLAC format because I didn’t ever want to experience this problem again. My files were literally locked away from me by a proprietary format. It turns out that artistic enterprises could benefit from similar ideals. Little did I know that some artists I already loved like Jonathan Coulton, Charles Mee, and Radiohead were already adhering to some of these ideals in one way or another. Mee offers the text of his plays online and encourages others to steal from them. Radiohead gave away their music as pay-what-you-want without a record label directly to their fans. Jonathan Coulton gave away his music using a Creative Commons license. Many other artists are doing the same or similar. 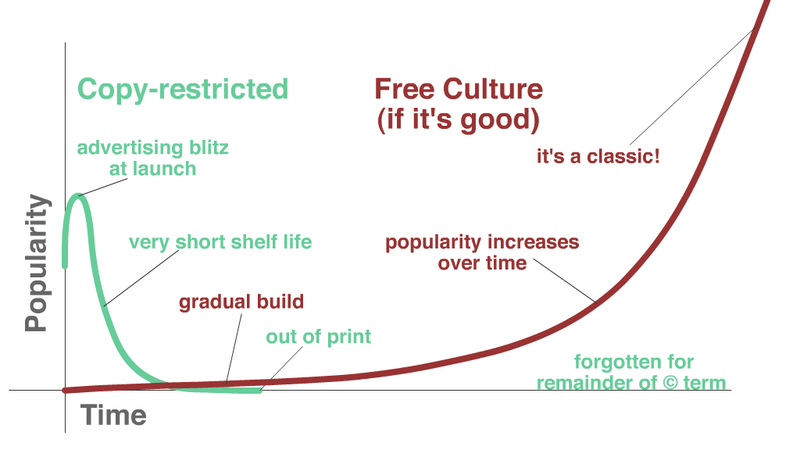 I’m not going to get into why not all of the Creative Commons licenses (there are several) are fully supportive of Free Culture (as others have addressed that issue) but I do find that the free culture supportive CC BY-SA license more fully embraces the brief four line ideal Lessig used in his recent presentation, “Freeing Culture,” as the above appropriated graphic from his presentation demonstrates. I really do appreciate the existence of Creative Commons licenses as they provide artists with an opportunity to really embrace the present age of the internet and allow new amazing art forms to flourish. These new forms spring forth from our increased ability to connect across artificial boundaries. In fact, they spring from our ability to copy. Creative Commons licenses try to balance the insanity of current copyright law (Lessig has called the governmental response to the internet “absurd”) with the reality of the world we live in (every computer is a copying machine). It is fitting, then, that I end with Nina Paley’s stunning post “The Cult of Originality.” I won’t repost the content of the piece here because it is aided so beautifully by images. In some ways the sentiment in that post can be distilled to Minute Meme #2: All Creative Work is Derivative. I strongly suggest you encounter both works (written/drawn and animated photographs) because they both free the artist from the fallacy of originality. We all create from the things around us. That includes people, art, events, inventions and other things that add up to the great inexpressible bibliography we call our mind. Our influences are innumerable and our sources inexplicable. This honesty about influence in art is freeing. You don’t need to pretend that you drink wine and channel a deity while near your keyboard for a certain number of hours each day. You can freely take and steal things from your culture instead. You can let it infuse you. Creative Commons helps allow you to channel your culture, allow your culture to channel you, and watch culture itself multiply. No. We won’t have a problem. I pay for my music… I just choose to obtain it in non-proprietary formats without DRM and through inoffensive mediums. To that end this tech enthusiast only buys used CD’s from local shops (surprised?). Sometimes I listen to Pandora. I purchased a non-DRM download of Girl Talk‘s Feed the Animals in FLAC recently. I don’t buy this stuff to rip and share with everyone via P2P networks either. I respect and obey copyright to the extent I understand it. You should too. I would love to live in a world where copyright made enough sense for non-lawyers to comprehend it (since that is what we apparently need to be able to do until the law changes). Part of the problem is the fact that there is no penalty for the holders of copyright to get it wrong and send cease and desist letters to anyone (like artists) for anything (including art falling under “fair use”). Sites like YouTube don’t have the resources to review every video on their site or even examine each cease and desist letter to ensure they’re not censoring free speech when they take videos down. This is how copyright breeds censorship. So should we get rid of things like YouTube? No. There are too many great things happening there. Some of you will undoubtedly consider me an extremist. That’s fine. Some of you will accuse me of trying to destroy art, music, theatre, film, and (most importantly) artists themselves. In that you are wrong. I create, promote and value art. I think that art is ultimately too important to be owned by anyone (especially people other than the artist) for over a century (as copyright law currently allows). No book should be “out-of-print” in a digital world because that concept just doesn’t make sense anymore. Old films shouldn’t be decaying in cans because copyright law financially prevents interested parties from restoring and preserving them. Parts of our culture are literally disappearing and disintegrating (Nina explained this somewhere). These cultural artifacts fade from our history and our historical record because of our outdated copyright laws. None of that even takes into account the amount of new art being removed from the internet with bogus DMCA claims. None of that even takes into account the amount of art that never even gets created because the artist is too afraid (or not even allowed) to employ their own culture in their art for fear of being sued by a confusing system that was never built (or extended) with artists in mind. I donated to the Musopen project on Kickstarter. This project was set up to fund new recordings by great orchestras of public domain works (Beethoven, Brahms, Sibelius, and Tchaikovsky) and release the recordings themselves into the public domain. This would mean that we could all listen to these great works, use them in our videos and for our productions, copy and remix and distribute them to others. Most of these composers have been dead for over a century. I’d say it’s about time. Hopefully now you understand me. …and inevitably other people and sources. A terrible event took place. An unlikely friendship was broken. One decision can’t be undone but two others hang in the balance. Can the advice of a sixty year old man help a troubled youth? Help himself? The Decision examines how the decisions we’ve made change the decisions we’ll make. This particular play was an outgrowth of a series of monologues I was writing while studying for my qualifying exams. I decided to look at so called “street photography” via the web and find interesting images of people. I would find a person that struck me (mostly portraits as I wasn’t interested in what they were actually doing) and take off writing something in a way that I imagined they might speak. Most of these experiments terminated (happily) in about half a page. They were a little world of their own. Sometimes they were successful and sometimes they weren’t. They were always interesting though (and I plan on releasing a set of them under the plays section once I have about ten pages worth of material to share. They just might make for an interesting moment or two of theatre (in performance or audition). The Decision, happily, would not conclude in half a page and was, instead, forced to continue as something a little bigger and a little more complex. The play is basically an outgrowth of a monologue, inspired by a street photograph, that refused to just be a monologue. As a condition of being considered (and subsequently selected) for the RROAPS festival scheduled for the coming spring I am unable to allow productions of The Decision prior to Texas Tech’s RROAPS . I do not, however, want to leave the play in a semi-hidden state. So while the play will (for the time being) be released under the unfortunate “ALL RIGHTS RESERVED” copyright license, I do want people to read and respond to it in the interim. One of the purposes of RROAPS is to put original works in front of an audience (after being in the forming fires of actors, directors, dramaturgs and designers) for the purpose of improving them. While I will certainly receive many great ideas and opinions from the many great people working on the show at TTU, I would also welcome comments from the larger community. At present it is released ALL RIGHTS RESERVED (which will change after production). I’d love to have you read and respond to the play in the comments below. Please understand that if you comment about the play you are giving me the right to incorporate those opinions, comments, and ideas into the work (or maybe some other work in the future). You needn’t worry. All of those works, too, will be returned to you by being released under a CC BY-SA license eventually. When I (I’m assuming that I will) complete subsequent versions/drafts of The Decision I will continue to post them here for your responses. When we are finished I will post the various variations of the script to show a progression. All will be released under a CC BY-SA license following the closing night of performance. Each Spring Texas Tech University does something wonderful: they produce a handful of original, student written, 10 minute plays. RROAPS (or Raider Red’s One-Act Play Spectacular if you prefer) is this amazing event. At first I thought that I wouldn’t be submitting anything this year (in fact, since I’m mostly off-campus I didn’t even remember that submissions would be due so soon) but upon hearing about it I truly had to think about whether or not I’d be submitting a work for consideration. Well, I’ve considered and I’ve decided to submit a play for consideration. In truth I didn’t write the work specifically for this festival (as I have in years past). Since my time has been taken up by re-reading an entire bookshelf in preparations for my Doctoral Qualifying exams (which begin early October 2010) I’ve been using the in-between time — when I need some head clearing — to compose some short monologues as a study of sorts. I’ve been reading these books since the beginning of summer in a non-stop fashion and some head-clearing was certainly in order. A monologue I’d been working on this week ended up turning into a short play on its own. Sadly, I won’t be able to post this play until it is either produced (if accepted) or rejected. Happily, I’ll very soon be posting my play The Man Who Became Sand (previously produced in RROAPS) on this site. I’ll also be working to reformat my other works for posting on this site in the future as well. This is the start of a mission, perhaps, to spread the theatrical goodness around a little better (much much more on that later).